Liberation! Thanks to a Spitfire electric scooter. Travel can be daunting for those with mobility problems. It is especially hard for those who love to wander down inviting alleys or spend an afternoon at a museum or bazaar. What a tour guide once called a “short walk” through the Halifax, Nova Scotia gardens used up the whole day’s energy for a handicapped tourist. Enter the Pride Spitfire® EX 4-wheeler. The smallest and lightest scooters have 3 wheels; one in front, two in back. They are designed for light weight riders, and for use around the house and on even pavement. If you plan to use a scooter for travel, consider the steadier, heavier four-wheeled version. The charm of historic places frequently lies outside of manicured paths. The 4-wheeler can handle curbs up to 2″ if you are brave enough to floor it: not really recommended. The Spitfire EX 4-Wheeler has one feature separating it from the others: it breaks down into five separate parts, none heavier than 28 pounds. They include the battery, removable seat, two-piece floor, and finally, the basket. Disassembled, it will fit into most full-size car trunks. The total weight of the scooter is 111 lbs. and it will support a 300 lb. driver. The range of a fully charged battery is 9 miles at top speed of 4 MPH. At 5′ 7″, I chose this model primarily because of its portability. The 3-wheeled model I tried was too short for my legs and did not have the stability of the 4-wheeled vehicle. The tires are solid, so there is no fear of a flat. 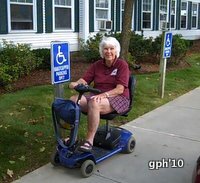 The scooter’s 48″ turning radius, as well as its maneuverability make it easy to navigate in tight places. I alternate between two batteries, so am never stranded. Customer service is laudable. The scooter was damaged in a recent move and would not go forward. The manual was temporarily lost. I called my supplier, SpinLife and was connected to Shannon, a patient young lady. With just my phone number, she was able to find the model, and then talk me through the fix. All on an 800 number and a real, live person.